Light and Speaker Stand - Spark Rentals Inc. 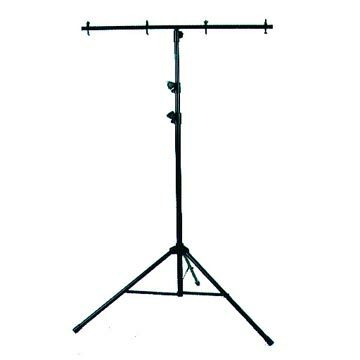 If you have no other way to mount our lasers or LED Lights, we strongly recommend renting a T-Stand to get the most out of your rental. Our equipment is easy to attach to the stand and if you feel you may need some help, all delivery orders include free set-up. T-Bar rentals include the required C-Clamps and a 3 meter power cord bar with three outlets. **Warning: When mounting equipment, remember to keep the stand balanced. For added stability, keep the tripod legs out wide, keep heavier items towards the middle, and balance lights on either end of the stand.